SKU: 8801|8802. Categories: Shop All ThinLine Products, Endurance Saddle Pads, Western Saddle Pads, Western Correction saddle pad, Western Work Saddle Pads, English Saddle Pads, Western Horse Tack, Therapeutic Saddle Fitting Pads. Tags: barrel pad, endurance pad, saddle fitting pad, Treeless saddle. The most Amazing Endurance pad for you and your horse, guaranteed. 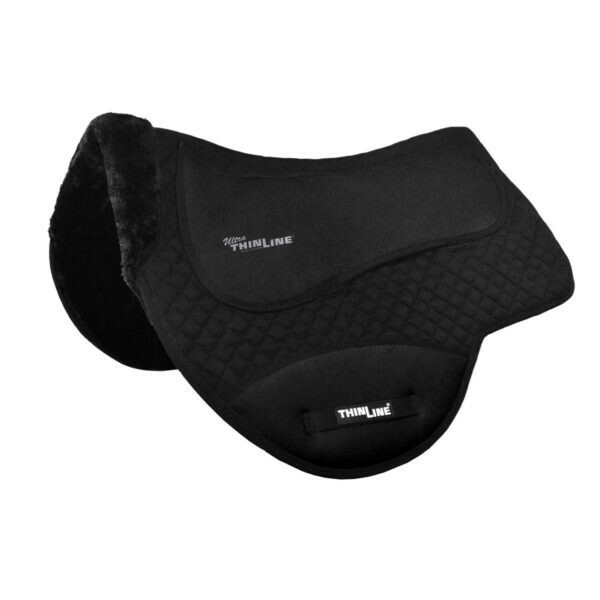 The innovative ThinLine Endurance Drop Rigging Saddle Pad offers superior support, comfort, and durability compared to other saddle pads on the market. The only pads endorsed by spinal surgeons, veterinarians, master saddlers, and are widely used by endurance and competitive trail riders all over the world. With Ultra ThinLine, you have close contact with the horse for better communication AND the ultimate in impact protection. Our endurance saddle pads for sale are available in one size and two versions: either Quilted Cotton or Washable Synthetic Fleece against your horse. Both pads have the additional ThinLine protection at the girth. Do you need drop rigging to enjoy this pad? Absolutely not! The additional ThinLine on the girth guard gives any cinch added comfort for your horse. ThinLine is the only equestrian product endorsed by surgeons, master saddlers & veterinarians. 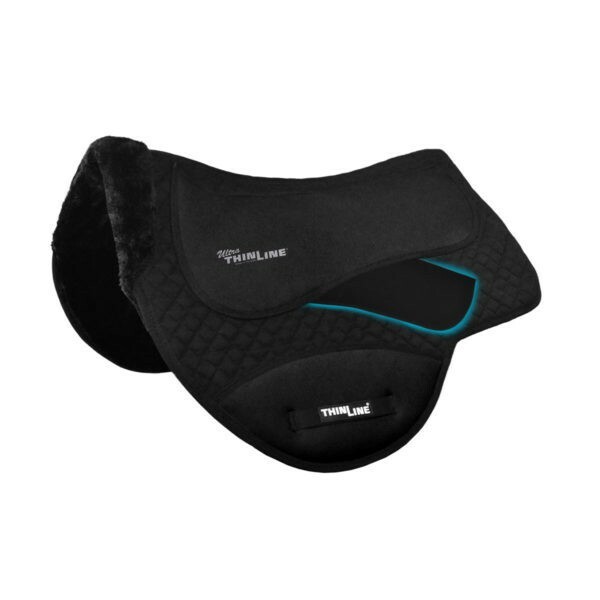 It is the dual benefits of extraordinary shock absorption and rider motion reduction that sets ThinLine apart from other saddle pads. It makes the ride better for both the horse and the rider. The base construction of pad is heavy duty quilted cotton with wool fill. It is available with or without synthetic sheepskin (all cotton or sheepskin base). The ThinLine lies on either side of the spine creating a perfect support panel which works well with endurance and treeless saddles. An extra girth, or drop rig, protection shield is made of ThinLine. This pad is designed to fit most drop or center-fire rigged endurance saddles, including the Specialized saddles, Sharon Saare Drop Rigged Saddle, and Stonewall, Boz , TW Saddlery saddles, and Synergist Saddles. 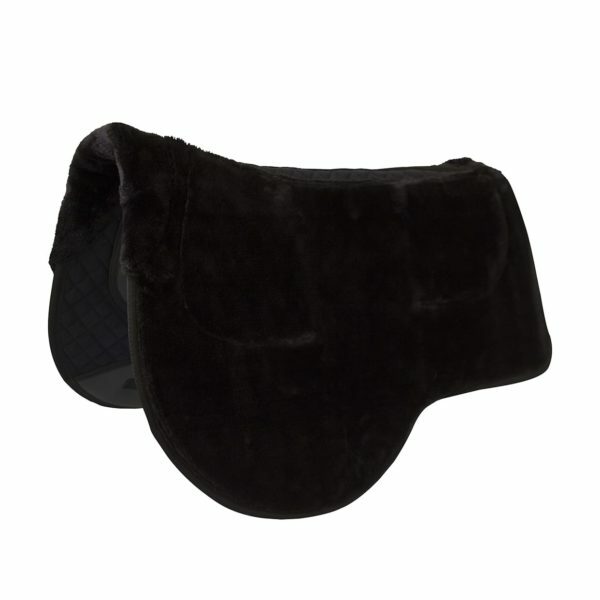 This pad works well for many saddle styles, including Australian saddles. We recommend measuring your saddle and comparing the measurements to those listed below to ensure your Western endurance saddle pad is a perfect fit for your saddle! Ultra ThinLine- Protect your horse under drop rigging with the best. Endorsed by Lucian Spataro, Jr.
– Ultra ThinLine guard at the point of drop rigging/girth or cinch to protect against pressures and rubs. – 4.7 mm thick (3/16″) Ultra ThinLine panel on either side of the spine for protection. ThinLine Plus Booster Shims may be ordered to create ThinLine Thickness. One of the great features of selecting synthetic fleece against your horse; you have incredible softness without the high maintenance of real sheepskin. So feel free to get sweaty and work hard! The ThinLine will be ventilating the heat from under your saddle. This pad may be a bit large for your home washing machine, but it is machine washable with cold water. Use our SheepskinWash for best results. Or brush off daily. A simple hosing will do as well. Your pad comes with a full one year warranty. looks gorgeous. I have the round skirted Shenandoah as well. Nice, nice pad. I check my horse Dooley’s back before and after every ride as I was having some issues with a new saddle/pad combo I bought. Even thought the pad itself was shimmable I was still getting soreness after a 3 hour trail ride. I bought this pad which I have been using over a felt liner. Problem solved. Zero soreness. Thank you for a great product! 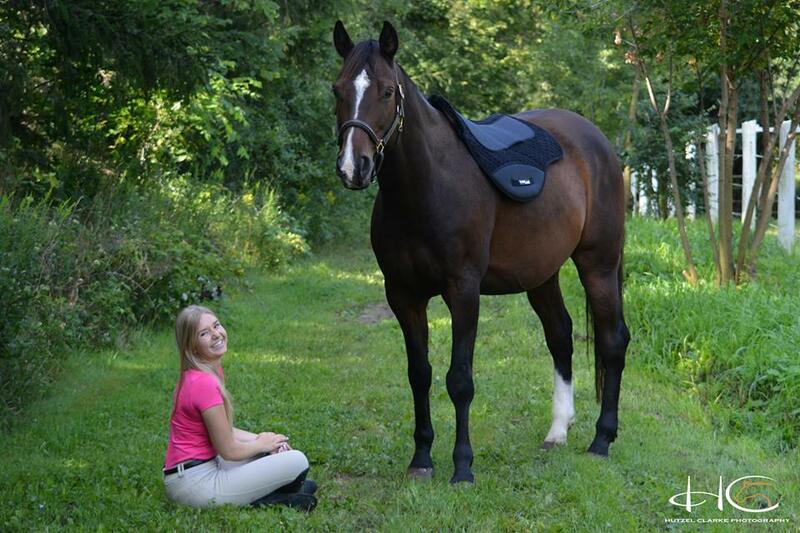 This is an amazing saddle pad. Absolutely simple to care for and is a breeze to clean up after a ride. Fits my saddles (english and western) and I never have dry spots or a sore backed horse. My back is loving it too. I have a friend who always uses it to ride when she visits, it’s her favorite as well! Awesome pad! Initially I was skeptical because it seemed so thin. It looked well made, so I gave it a try. After the first ride, I loved this pad! 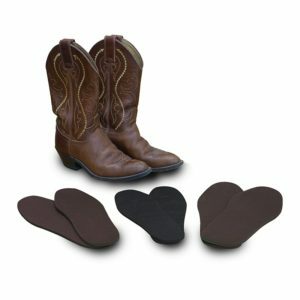 Thinner and less bulky than the traditional western pads BUT provides great protection and comfort for the horse. My saddle even fits better. I love this pad! Ordering another after I gave my original pad to a friend with Rheumatoid Arthritis. It’s the perfect pad for when you have a saddle that is a glove fit, that doesn’t need any extra padding. I have some back problems myself and will not ride without Thinline anymore! J’aime beaucoup ce tapis mais ce qui est le plus important c’est que m jument l’aime encore plus. Vraiment confortable et il apporte une belle chaleur sous la selle pour les saisons fraîches ou froide du Quebec. Love my Shenandoah pad! Fits my gaited tree endurance saddle perfectly, adds protection without bulk, or changing the fit of the saddle, and stays in place beautifully. I didn’t mind spending extra money for this pad; I love thinline products, and after getting this, i don’t need any other pads. This is a great investment ! Q All cotton pad or the fleece lined? This is the question. Live in Florida. Gets very hot here. Need a material that will not add to the heat on the horse's back, help wick sweat away, AND will help stop slipage. Which material would be best for me? A Thank you for your question! The cotton version is the recommended option for you. The cotton and the ThinLine panels allow for heat ventilation and the reduced thickness will help prevent saddle slip. Q Does the cotton bottom make the total thickness thinner then one with the fleece? A Thank you for your question! The all cotton version of this pad measures 3/8" thick and the fleece version is 1/2" thick. Q Can the all cotton pad be washed? A Thank you for your question! Both the all-cotton and fleece lined styles of this pad may be washed. The care instructions recommend that they be washed in cold water with a mild soap, preferably by hand. They can also be washed in a large front loading machine with the Ultra ThinLine panels turned to the inside. Hang to dry out of the sun and away from heat sources. Q How long does it take for delivery to 12972? Q Do you have to buy front and back shims separate or do they come in a set? A Thank you for your question! We offer the Saddle Fitter's Kit, which comes with 1 set of front shims in ThinLine Plus thickness (1/4") and 2 sets of rear shims in Ultra ThinLine thickness (3/16"). Simply follow the link below, select your pad from the first drop down menu and Saddle Fitter's Kit from the second drop down menu. If you prefer a different combination, they would need to be purchased separately. Q What is the total thickness of this pad? A Thanks for your question! This pad is constructed of a quilted cotton base with fleece lining (about 3/4"), and has Ultra ThinLine panels (3/16") sewn across the top of the pad and at the bottom of the flap. In the areas covered in Ultra ThinLine, the measurement is just shy of 1", and is about 3/4" everywhere else. Q Will this be a good pad to use with a treeless barrel racing saddle? A Thanks for your question! This pad is a great fit for treeless saddles due to its high wither profile and the Ultra ThinLine panels across the top of the pad. We also just introduced a new shim style, the Booster shim, that is a great addition to use with a treeless saddle. 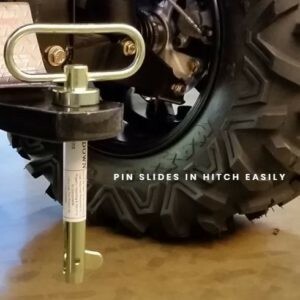 It provides the extra lift and cushioning along the full length of the pad that so many treeless saddle riders want for their horse. Be sure to check the measurements to be certain that this pad is the correct size for your particular saddle.